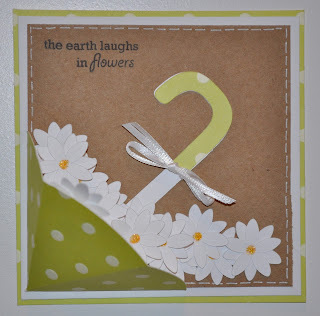 Today's challenge at Whimsical Wednesday was to use an umbrella, rain boots, rain drops or flowers in your design - so I picked two out of four. Since I had done the umbrella centerpiece/favor for CWC last week and absolutely loved that umbrella, I wanted to attempt to use it again in a different way. So, this week I made a 3D card - filled with lots of daisies. Roberta ~ WOW! This is just GORGEOUS! I LOVE how you did your umbrella and flowers! The 3-D looks amazing! Love the papers you used ~ almost used that too.. recollections??? I have to say that is so darn clever! Daisies ~ one of my favorite flowers but never thought to use them! So funny we are on the same wave length! Great job! Very nice! I don't have that cartridge, is that a feature or did you create that on your own? I love that card! This is SO COOL! I love the 3D umbrella and all those pretty flowers! Love this card. It's so pretty. OMGoodness! This is just sooo cute! I love it! super awesome! I just made bridal shower cards, this would have been terrific for the bridal shower invitations. So clever my friend! 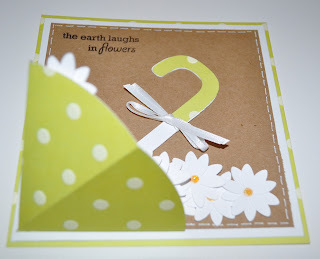 Just love how the umbrella is 3-D. And the daisy's are perfect! Great job with the challenge. WOW!! awesome card! LOVE the 3D. Roberta you did an outstanding job! I just adore the umbrella, great choice of colors too. Those daisies are terrific as well. You can never go wrong with polka dots & stitching too. This has it all. Roberta, I love your card. The 3d umbrella is fantastic. It is just so cute and full of spring!!!!! daisies are my favorite flower :) love what you did with the umbrella. lovely card. Super card..... love all the daisies! What an incredible card! I love the dimension of the umbrella and the flowers coming out of it! TFS!